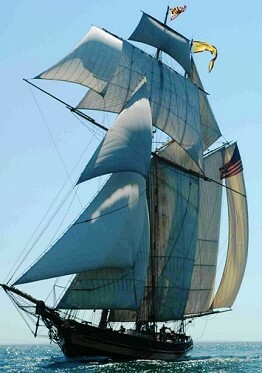 Pride of Baltimore II is a reproduction of an 1812-era Clipper privateer. She is Maryland's working symbol of the great natural resources and spectacular beauty of the Chesapeake Bay region, and represents Maryland as a Goodwill Ambassador wherever she sails around the globe. She is owned by the citizens of Maryland and is operated by the private, nonprofit organization, Pride, Inc. 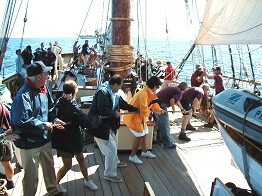 Pride II was built by shipwrights and volunteers in Baltimore’s Inner Harbor, and commissioned in 1988. She is typical of the 1812-era topsail schooners, the type of vessels, called Baltimore Clippers, that helped America win the War of 1812 and finally secure the new nation’s freedom. Baltimore Clippers, with their easily handled fore & aft rigs, and relatively light displacement versus the square-rigged British ships of the time, outmaneuvered the enemy ships, avoiding their superior firepower, while harassing them with lighter but more accurate cannon fire. Pride II is a swift and powerful sailing vessel, and an unforgettable thrill to sail aboard. Since her commissioning, Pride II has sailed nearly 200,000 miles, and visited over 200 ports in 40 countries in North, South, and Central America, Europe, and Asia. In 1998 she undertook her first voyage to Asia with port calls in China, Taiwan, South Korea, and Japan. 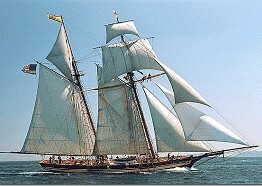 In 2000 she made her fourth trip to Europe capturing First Place in her Class in a Transatlantic Tall Ship race. With her sharply raked masts, her abundance of sail, and her sleek profile, Pride of Baltimore II captures the imagination and makes friends for Baltimore and Maryland wherever she goes. She is indeed a memorable Goodwill Ambassador. Pride II has room for six Guest Crew for overnight passages between ports of call. Guest Crew are assigned to a watch and are incorporated into the life of the ship up to their level of interest and ability. They work alongside the professional crew and get a firsthand insight into what it takes to sail a tallship. The opportunity to sail aboard Pride of Baltimore II is available to anyone with a passion for sailing, and a love for adventure and the great outdoors. Guest crew members share in the daily operations of the ship alongside the professional crew, to the extent of their ability and interest. Three passenger cabins with two berths each can sleep six guest crew members in co-ed accommodations.